My nieces have very strange tastes. It all started about four years ago when my then six year old niece wanted a Pokemon shirt. At that time, Pokemon had yet to get popular again so there was no such thing, much less for a little girl. So I found pics of her favorite Pokemons online, printed them on transfer paper and ironed them on a shirt. I have a picture of it on my phone (I have a REALLY old phone!) but I have yet to figure out how to get it on my computer! She went crazy for it and she still owns it (she's that skinny). Now her little sister just turned six. I asked her what she wanted for her birthday. My three year old son piped up and said, "My mom should make a purse for you!" I found this incredibly sweet that my little guy not only recognized what I do but suggested it. So precious! My niece's answer? "Uh, no." Gotta love kids. We threw a few ideas around until her mom suggested I make her an Oshawott t-shirt. My niece immediately broke into a grin. Osha-WHAT you may ask? Apparently, he's some sort of otter Pokemon from one of the DS games. Even though the Pokemon craze is again in full gear, apparently they don't make Oshawott t-shirts. What is it about turning 6 that makes you want impossible things?! So again, I got a pink shirt (her favorite color) and again, searched online for images. I used Photoshop to make sure the images were all the same size (ppi). Then, I moved all the images onto one photoshop page (make sure when you create that page that is has the same ppi as your images) and printed it onto transfer paper. My favorite transfer paper is Avery 3279 Dark Fabric Transfers. My husband and I have used them for many projects and love them. The images are crisp and wash well. Forget boring center placement (not to mention it's very hard to pull off!). I love starting at the bottom left corner and moving in a diagonal upwards. At the left corner, I lifted the middle guy to make him look like he was hopping. I used a similar image on the pocket to look like she had a little Oshawott in there! After all, "Pokemon" is Japanese for "pocket monster." One happy (and adorable) niece! One of the reasons she was so keen on a homemade shirt was because I made her one for her fourth birthday. At the time she was big into Spongebob (I still am!). 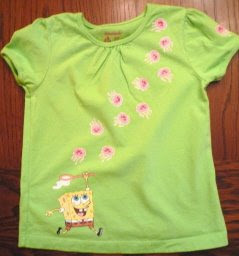 I knew I could find a million Spongebob shirts anywhere, but I wanted to make her a special one just for her designed by moi. I liked the idea of Spongebob jellyfishing across a shirt. Since the jellyfish on that show are pink, I picked a green shirt. Then, I went through the same process: online search, Photoshop, print, cut, iron. 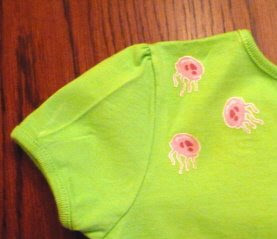 Though, this shirt was definitely a team effort by my hubby John and I. John cut out all of those little jellyfish! He is a ninja with a swivel knife, I tell you! Sometimes it actually does pay to be married to a SCAD graduate! I thought it came out so super cute. We even ironed a few jellyfish on the left sleeve and the back of the left shoulder. I want one my size! Now, this is where I went insane. 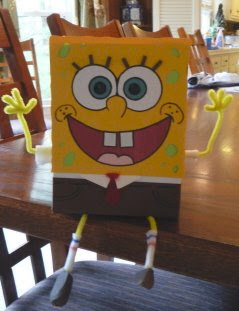 I decided to "wrap" her gift to look like Spongebob. I seriously spent more time making this box than making the shirt! But, I thought it came out looking pretty good. It was also a lot of fun to just get "lost" in a project. When it was time for my niece to open presents, this was the one she wanted to open first! And, her older sister thought the box looked "freaking awesome!" I used a shoebox from "The Children's Place" (perfect small size with a flap top--plus that's what I had!). I wrapped the box first in green paper. Then, I sort of did the rest of him piecemeal with cardstock. 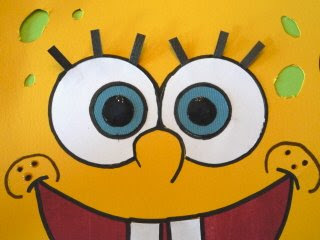 I cut holes in the yellow paper so the green would show through, giving the illusion of his sponge holes. His legs and arms were yellow pipe cleaners. His socks were white felt (I used markers for the stripes) and his shoes are paper. I know it's insane but I had so much fun making that box! As always, comment or convo me through my shop for more details on projects or questions.